NMM 1202. 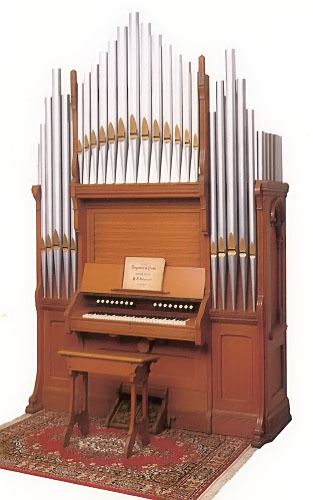 American reed organ by Mason & Risch, Worcester, Massachusetts, ca. 1895. Vocalion model. The pipes, made of solid wood, are an ornamental facade. Arne B. Larson Collection, 1979. Stop list (as it appears from left to right on draw-knobs): Bass coupler; Sub Bass 16'; Dolce 4'; Bourdon 16'; Trumpet 8'; Open Diapason 8'; Principal 4'; Stopped Diapason 8'; Melodia 8'; Harmonic Flute 4'; Open Diapason 8'; Cornopean 8'; Bourdon Treble 16'; Dolce Forte; Vox Humana; Treble Coupler.